I've shared the work of my amazing colleague, Carol Janka, on the blog before. She's a fantastic art teacher. I always feel inspired by the things she shares. This link will take you to a post about her students creating their own work based on Janet Fish's Lawn Sale. Carol shares a lot of her teaching ideas and student's work in a Facebook Group called Elementary Art Teachers and is a real leader there. If you aren't already in that group, hurry up and join us! Kindergarten mixed media fall landscapes are finished, just in time for winter. Over several art classes, students were introduced to a variety of media and processes. Discussions were related to home, school, field trip to corn maze and pumpkin patch. So, so sweet how they directed themselves to making meaningful lines and shapes. The inspiration and jumping off point for this lesson came from Pamela Holderman. Pamela's blog wasn't on my radar until Carol shared this. So, now we all have a new blogger to follow. I got some ideas from her A Starry Night in iPad and Mixed Media post. 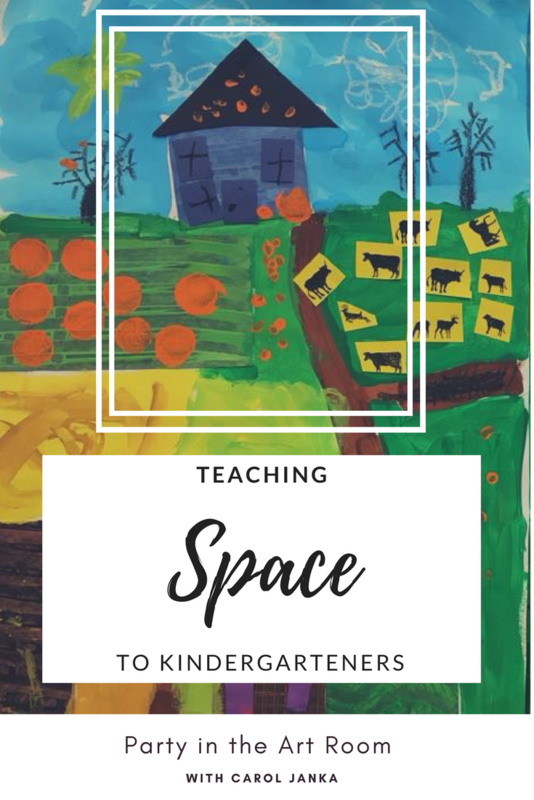 Carol told me that Pamela's post got her to thinking about the idea of presenting space to kindergarteners, which we all know is hard. They viewed a lot of Charles Wysocki's works. For the first step, they created the sky and land. Then, they created the home or school. Farm and fields came next. Finally, they created things that grow and live (animals and plants). "a blast, and the kids were taught how to use many media and tools to complete work." Grandma Moses and Theora Hamblett. Did somebody say Theora Hamblett? Check out this Art is at the Core article about how teachers can use her works to teach core subjects. Also, check out this Getting to Know the World's Greatest Artists about Grandma Moses. I wasn't aware there was one for her until I started writing this post. So, I thought I'd share. Thanks, Carol, for sharing this with us! We love it! What do you guys think? Leave a comment. I read them all. I promise!